The countryside is lush and beautiful. 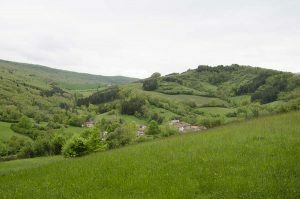 In the part of the midi-Pyrenees I am in, the landscapes range from pastoral to forested to dramatic escarpment where the remains of castles are located. It is early May, so a bit cool and rainy. No plein air painting for now. It has been a time for sketches, walks and using the camera. I have brought a limited number of pencil crayons as well as my acrylics and some watercolours. As you can see from the photo, landscape painting would be ideal. There are just so many beautiful scenes here. I will try and post a daily sketch and post my paintings when they are done.